Your style is often times the first thing people see about you. Having a great sense of style and dressing well can make or break you. Whether it be becoming more attractive to women or succeeding in business, people judge you on the way you look and dress yourselves. So you better show yourself to the world from your best side. 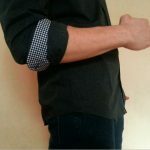 In this section, I help you find and create your own unique and awesome style and give you all the tips you need on dressing better, grooming and becoming more attractive. And never forget. Dress for success.